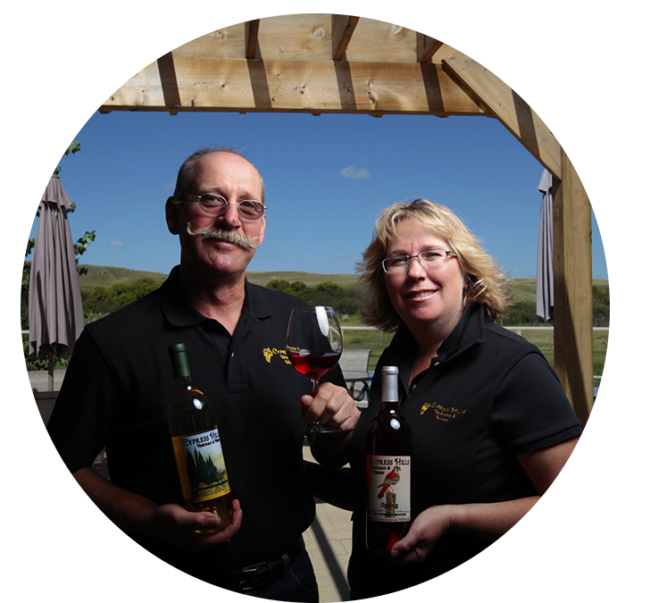 Cypress Hills Vineyard and Winery – Taste the Prairie Sunshine! Our wines are available in most liquor stores in Saskatchewan. Nestled at the foot of the historic Cypress Hills sits Saskatchewan’s Premier Winery. The vineyards are bathed in warm sunshine in the summer and blessed by the mighty Chinook winds in the winter. It’s this unique micro climate that helps produce wines with such intensity and flavour! From the chokecherries and saskatoons that have grown wild along the creek since before men walked the hills… to the newest cherry cultivars from the University of Saskatchewan, the Winery strives to stay true to fruits the Prairies have to offer. Fruit wines are by nature slightly sweeter than most grape wines and can be a joy to drink when paired with good friends and lively conversation! Like a beautiful September day, the wines unfold on your palate. The warm prairie sunshine that is stored in the fruit can be tasted in the rich depths of the wine. But like the subtle changes in the fall air, there is an underlying crispness to excite your senses. As with the change of seasons, not all the wines are the same. From the semi-dry cherry wine with its spicy finish to the pleasingly sweet Mead made from local honey, the flight of fruit wines produced are a joy to drink and a direct reflection of our province. A belief that the prairies have so much to offer spurred owners Marty and Marie Bohnet to establish the Winery in 2004. Former ranchers faced with low cattle prices, the Bohnets put their entrepreneurial spirit to work to develop nationally recognized wines. Ten years of quality visitor experiences have established a strong following for the wines and demand is on the rise. In response, the Winery has moved into a strictly manufacturing role as of the fall of 2016 and will no longer be open to the public. We encourage you to shop on-line or visit liquor stores throughout Saskatchewan to purchase these gorgeous wines.